Kitchen and Residential Design: Cheap Fixes: First up, clean and purge! OK, for the first in my series on cheap fixes I'm going to start with the cheapest thing I can think of to give your kitchen a face lift: Clean it. I'm not talking about a cursory swipe with a wet sponge either. I mean a spend-the-whole-day-Saturday scrub and purge. I do this once a year or so and it gives me a lift that lasts for weeks, as sick as that sounds. I hear about people's renovation fantasies all day long. "If I only had X and Y then I'd keep my house clean, my kids wouldn't ignore me, I'd pay my bills on time and I'd have a happy marriage." Newsflash: life doesn't work that way. The events of your life rush in to fill the spaces you leave for them. An extension of that, I'm convinced, is the periodic house purge. Get rid of your crap and clean things up and the first of the fantasies I just listed will become a real thing. It's magic! Many people think they don't have enough storage space, but the real problem is that they have too much stuff. Kitchen cabinets are a perfect place to hoard lidless Tupperware containers and useless kitchen gadgets. It's time for a purge. Pour a bucket of hot water, add a good splash of Ammonia and grab a rag. As a technical aside, when you're cleaning things like kitchen cabinets, you need to use a cleaner that won't leave a residue. 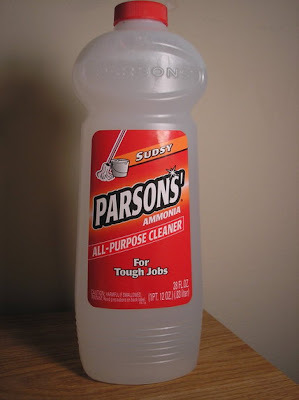 Parson's Clear, Non-sudsing Ammonia is the ultimate cleaner and at about a buck a bottle there is nothing better to use. That's coming from a pro too. Don't believe the hype surrounding overpriced cleaning products. The fewer ingredients involved, the better off you are and nothing cleans as well or smells as clean as Ammonia. Your grandmother was right. Or at least my gandmother was. Start with one cabinet and empty it. Wipe it out. Only put back the things that you use. That sounds pretty elementary, but most people need to be forced to do this sort of thing. Me included. I have in me the hoarding instincts of a man who's been starved and deprived his whole life. The reality is that I've never really wanted for anything. Still, that doesn't stop me from clinging to every lidless plastic container and chipped plate I can get my hands on. Get rid of it. All of it. Put back what you use and set the other stuff off to the side. With one cabinet down, move onto the next one. 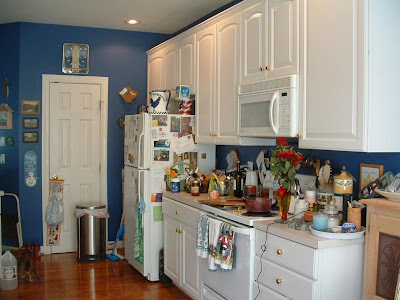 Before you know it there will be a pile of stuff in the middle of the floor and you'll have doubled the amount of space you have in your kitchen cabinets. It'll be a Christmas miracle. What it will do too is give you a sense of control and accomplishment and it will keep you from spending a whole lot of money on something that may not need to be replaced right away. Try it this weekend, even if you only get through one of your cabinets, it will be a start. Set a goal and assign a timeframe to your project. Make it a priority. If you dismiss this sort of thing with a wave of the hand and a very loud announcement that you're too busy, remember that I'm too busy really means That's not important. If you're an I'm too busy repeater, try substituting That's not important when you would ordinarily say I'm too busy for a week. Go ahead. Try it. In no time at all, I think you'll find you have all kinds of time you didn't know you had.